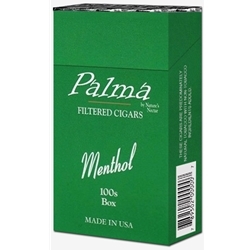 Palma Menthol Filtered Cigars are available in Box 100's and packaged 20 cigars per pack, 10 packs to a carton for a total of 200 premium filtered cigars. Palma Filtered Cigars are SMC's second house brand manufactured in a simple and neat packaging that visually depicts the crisp flavor that smokers everywhere are learning to enjoy. Produced in three unique flavors, Palma’s are now available nationwide and can be shipped right to your front door step buy Smokers Discounts!